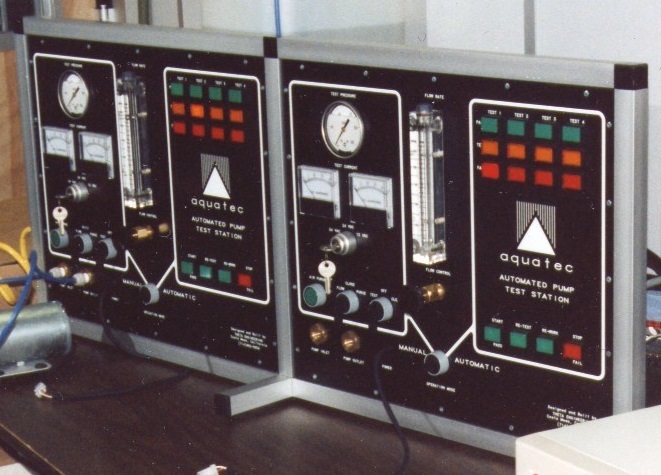 Theta Engineering designed and built two generations of custom computer-operated test fixtures for a water pump manufacturer. These test fixtures were dual-mode; all functions could be controlled manually from the front panel, or automatically from the computer. Test software was developed using Microsoft Visual Basic. Mechanical design, plumbing, front panel artwork, circuit design, circuit board layout, system construction and software development was done by Theta Engineering. The dual-station design made it possible for the operator to be connecting/disconnecting one pump while the other pump was being automatically tested, thus improving throughput without requiring additional manpower.